Subtly innovative, it certainly lives up to PJE's reputation for dependable and quality instrument making. Nice modern acoustic tones. Tip-top build and finish. Represents good value, given the PJE tag. Great for fingerstyle players, too. Might be tricky to find a complementary pickup system. The PJE Signature series currently consists of four models that all use back and side woods indigenous to these fair Isles. As with designer Patrick James Eggle's latest electric project, Fenland bog oak is featured on the two Mars Signatures, while our review Neptune 'baby' jumbo uses Honeyed Sycamore. Even quite seasoned players would cast a look at the back and sides of the non-cut Neptune and think it's maple rather than sycamore, which has a history of being used broadly as a tonewood. "Wood choice asides, it's immediately apparent that there is a great deal of really nice craft in this instrument"
In fact, pre 20th century, it was a native wood of choice (it's debated, but not confirmed, that the Romans imported it). But since the exotic, denser and more powerful-sounding tropical hardwoods became easier to access for instrument makers, it's barely had a look in. In the steel-string world there's been a somewhat snobbish body of anti-maple (sycamore's botanical twin) opinion, which Taylor for one has begun to address. So, let's hear it for sycamore, too. Wood choice aside, it's immediately apparent that there is a great deal of really nice craft in this instrument. 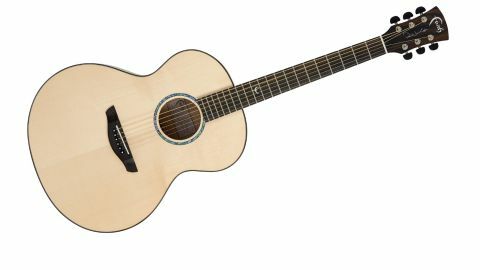 It has an invitingly classy look evidenced by the super tidy neck binding, the small dot position markers along the edge of the fingerboard, and the mother-of-pearl logo inlaid into the ebony fingerboard at the 12th fret. Care has clearly been taken with choices of wood throughout: the rosewood binding, head veneer and back strip complement the honeyed sycamore. The top is high-grade Englemann spruce, and inside the woodworking is pristine. The X-brace and strutting is quarter-sawn 'piano-grade' spruce, with mahogany side reinforcements, and you get unbleached bone nuts and saddles. It's very classy, yet understated. The only 'bling' is the green abalone used for the soundhole decoration and the dots on the ebony bridge pins. Reflecting the modernistic design, both models feature bolt-on necks and two-way adjustable truss rods. Faith says that sycamore sounds "similar to maple with a relatively dry, crisp tone that offers both power and clarity [with] a little more resonant response than regular flamed maple". To our ears, it has what we increasingly find ourselves referring to as a 'very modern tone': bright and shiny, if a little light in the bass. There's a rather present top end and a constrained 'newness' about the sound, which is hardly surprising, and we'd expect some of that to mellow with playing. As is, it doesn't suggest itself a first choice for a solo instrumentalist, but playing in an ensemble we find a tightness and power that really maintains its presence. It's satisfying to strum and demonstrates a broad range of subtle tonal shades and dynamics as we experiment with different types and thicknesses of picks. With a Dunlop 0.73mm, for example, strumming over the soundhole there's a midrange warmth and click that's nicely old school. Still, there's a confidence-boosting weight and scale to the handling. It feels solid but not chunky. The high-glossed mahogany neck has good depth and a sort of rounded 'U' profile, giving a sense of substance and comfort. The 55mm string spacing at the saddle means fingerpicking - even for those of us with fatter digits - is a pleasure. While the Grover tuners are smooth and responsive, so tuning between regular and relatively extreme open tunings was drama free. All good! It's hard to think what has been overlooked with this acoustic. It's a state-of-the-art design that centres on quality woods and a crisp, contemporary build.